Words & Music by Tamion 12 Inch. Tamion 12 Inch: B.Kerry, C.Samuel, K.Mike. In the last year, Ersatz Audio has had the privilege to work with many new artists. This includes unknown artists and also established artists new to releasing on Ersatz Audio. With great excitement, we are now able to release the debut EP from Tamion 12 Inch. First heard on the "Misery Loves Company" compilation, Tamion 12 Inch now has a chance to further elaborate on their unique sound. "All Black, Eyes Closed to the Excess of Disaster" contains 5 new songs, complex in their duality. Dark and lively, intoxicating and rather sobering, adolescent frenzy and studied severity. 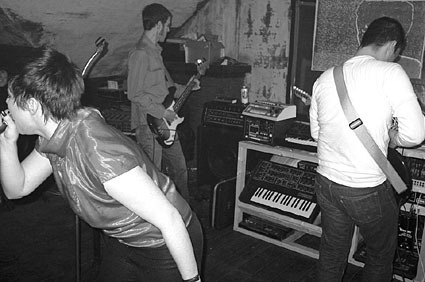 Detroit's Tamion 12 Inch has been playing live (as themselves and in many other incarnations) for many years, putting on amazingly intense live shows, that can both intimidate and enthrall. That they are able to capture their live show intensity when in the studio is an ability that definitely separates them from many. The band: B.Kerry on vocals, C.Samual on analogs and new member K.Michael on bass and electronic percussion, describe their sound as "A lived incident. A series of first takes and peeled layers. A raw emotion seen after the process of subtraction." Punchy analog beats compliment raw yet catchy synth-lines, completed with maniacal sing-along vocals that creating an ecstatic aural experience. 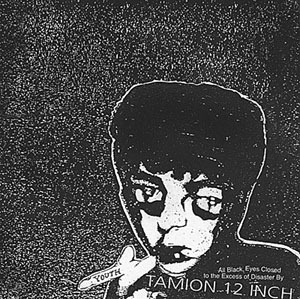 Open your eyes, and prepare to enjoy the discomfort of Tamion 12 Inch. 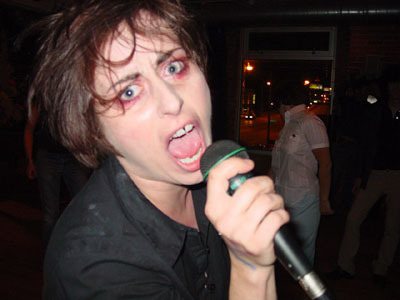 "Future Headline: Move over Yeah Yeah Yeahs, here's T12I!"